“Wine Country” _Fall Art Print _Pilot Mountain, NC _Vineyard in Yadkin County, NC. 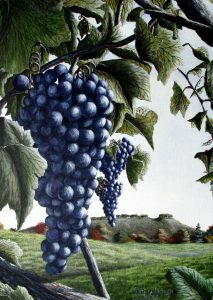 “Wine Country” is a limited edition print view of Pilot Mountain, North Carolina through the delicious blue grapes of a local vineyard in Yadkin County, NC. The image size is 13″ X 18.5″ and frames up to approximately 22.5″ x 26.75.” This fall scene will make a lovely addition to any room in your home or office. Buy Now.